Use the Goal overview report to see which sources are best at referring traffic that converts to your site. FIlter the information by Paid or Organic traffic, and by source; search term, search engine, campaign, mailing, newsletter, banner, etc. This is useful because you can see exactly which traffic sources send you traffic that converts. Essentially this is a financial report which translates into a planning spreadsheet for your SEO and revenue-generating strategies. Please note that in order to populate these columns, it is necessary to use the Destination URLs in your campaign settings. In other words, enter this information at your traffic source; adwords, double-click, yahoo, etc, and it will be passed to us. See screenshot below for an example of a Conversion goal table (expanded to a specific Paid source) which shows the source as we named the campaign, specified the search engine, followed in parentheses by the (search term). A list of your (pre-defined) conversion traffic goals organized by number of visits. Results are divided into organic (free) and paid (sponsored) per search engine. Click on either category, “organic” or “paid”, to see search terms for each group. To compare sources and answer questions. Which source delivers the most conversion. Where does high quality traffic come from? Source: These are the sources of traffic to your website. This list includes all search engines that send traffic to your site. Click on “organic” or “paid” to see all keywords per search engine category. The keywords are the search terms the visitor used to find your site and complete the goal. Visits: This is the number of visits that included a click on one of your defined goals. Click a number in the Visits column to expand. Conversions: The total number of visitors who “converted”: reached a defined goal. Click on the number to expand. Goals reached: The name of the goal reached that caused a conversion. Cost per Click (CPC): Price paid for the click. Opentracker sees this information if the cost of the click is defined in the Destination URLs of your PPC campaigns. Total Costs: The total costs of all clicks. The cost-per-click is often unique and must be defined in the Destination URLs of your PPC campaigns. Opentracker then sees the information automatically. Total Value: Total value of all goals reached. 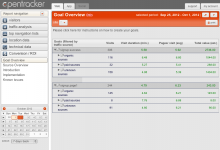 The value of each goal is defined in the “add goal” wizard. ROI: Total value of all visit activity minus cost of all activity. Values are pre-defined using wizard. Costs must be inputed through Destination URLs directly in PPC campaigns. The Goal overview report displays all (conversion) goals to your site filtered by visits (popularity). Visually, the report is made up of a list of all defined goals on your site, in order of popularity. For each goal it is possible to distinguish between Paid and Organic sources. If neither is recognised, the source is Unknown. It is possible to see the number of conversions per search term keyword and search engine for each goal. Please note: in order to populate this report, you must define your goals first. Goals are defined by placing a goalscript in the pages which are goals. Click here for a 1-2-3 guide to implementing Conversion Goals. Click here for an overview of implementing Conversion reporting.